I’ve been trying to get back into the habit of blogging, but it’s so tricky. I’m not sure how I used to manage to write 3 posts a day; I’m now struggling with only writing one post a day! We’re already 9 days into November, but I thought I should write up a post on the events I’ve been to the past months. Back in September I attended Charity Hack, another two day 24 hour hack competition, where developers have to “hack” something together for charities. I had been the past two years and both times had been a lot of fun. Last year me, Cristiano, Dom and Caius even won the first prize (an awesome trip to San Francisco, I can’t believe that that all happened a year ago). So of course I had to attend this year’s one as well! Again I teamed up with Cristiano, Dom and Caius to work on a hack: CharitySite. The idea was to create a simple CMS for charities, with which charities could setup their own simple site without having to tweak too much. They could create and manage pages, posts and events, show photos, manage their own mailing list and more. The judges liked what we created and we ended up coming 3rd place, each winning an Xbox and a Kinect! Who knew it was so easy to make truffles? I didn’t. 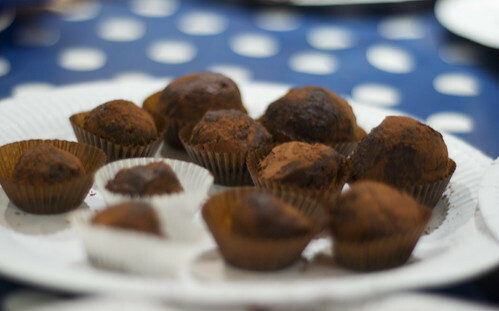 Great British Chefs organized a lovely truffle making workshop at Homemade London with one of their chef’s recipes. I made an awesome batch of Earl Grey (bergamot) flavoured truffles. It’s super easy to make truffles and I am definitely going to use that recipe again! Ladies Who Code is a new meetup group for, well, ladies who code. I went to their second meetup, and it was great meeting other female developers and sharing our experiences. Girls do tend to be outnumbered by the guys at hackdays and other tech events, and events such as Ladies Who Code is a great way to get more girls along. I spoke a bit about organizing events, going to hackdays and some of the hacks I had done in the past year. I’ve been using Unruly Media for a while now (occasionally you might see a post with one of their videos) and a couple of weeks ago they organized a tech night for bloggers. 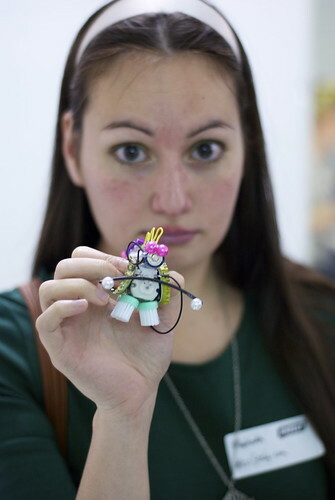 Everyone got to make a cute little “robot” out of toothbrushes, batteries and other random stuff. Mine looked adorable (if I say so myself), but I glued some of the parts wrong, so it couldn’t move that much. TweetCamp is one of those events that I’m not sure I completely get. It’s an unconference about Twitter. Right. Okay. So we’ll sit around and talk about Twitter the entire day… It’s the type of event that does attract social media douchebags and if you go to the wrong sessions, you’ll end up with a really bad experience. I managed to go to the right type of sessions for me though; I went to discussions about using Twitter for events, and how journalism has changed because of Twitter.